The world around you can be a boring, monotonous place at times. Every morning you rise with the sun and go about your day with the usual schedule until the sun sets so you can sleep and do it all over again. The days start to bleed together and months pass before you realize what’s happening. If you’re starting to get in a rut, the only thing you can do is change your routine. Hopefully you don’t need something as drastic as a move across country or change in career, but a little something to spice things up can help. 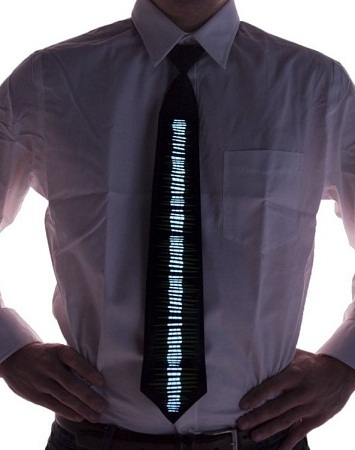 These LED Animated Neck Ties are certainly going to add a pick-me-up to your day, as well as that of anyone else around you. They’re all about 17 inches long, and will need two AAA batteries to do their job. Of course, what that job is will be up to your decision of which one you want since they all have an interestingly unique style. There are six options to choose from including the sound responsive equalizer, blue diamond, and stripes, or the ducks, eagle, and piano which don’t respond to sounds. You can show up ready to party at the office, and turn on the lights when you’re free from the cubicle (or you can keep them on while working, because why not?). These will cost you around $25 regardless of which one you choose. If you’re wanting every day to be special it will be easy to get a collection together pretty quickly.